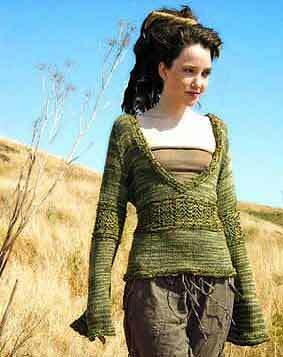 Stitch Diva's femine but funky Renaissance Simple Knitted Bodice - Dramatic Long Sleeve Version. With just advanced beginning skills, make yourself a dramatic long-sleeve garment bodice that looks extravagant and fits your curves perfectly! Worked from the top down in one piece, this sumptuous design requires minimal finishing and features a super-simple lace accent that will make you look like a pro knitter even if this is your first sweater. To ensure a perfect fit, we detail a try-as-you-go construction approach and provide simple shaping techniques. Wear with a cami underneath or dare to wear nothing underneath at all. Whichever way you wear it, you will be a smart and stylish damsel who used her low-impact efforts to create a super high-impact result. Please note: kits come with enough yarn for size selected : please check chart at bottom for comparisons. All needles listed are required for this pattern. Don't see the color you want? We can special order any Colorway! Just Key in your Special Order Color Number and it will be used for the knitkit order. View ALL Colorways for Artyarns Supermerino here.